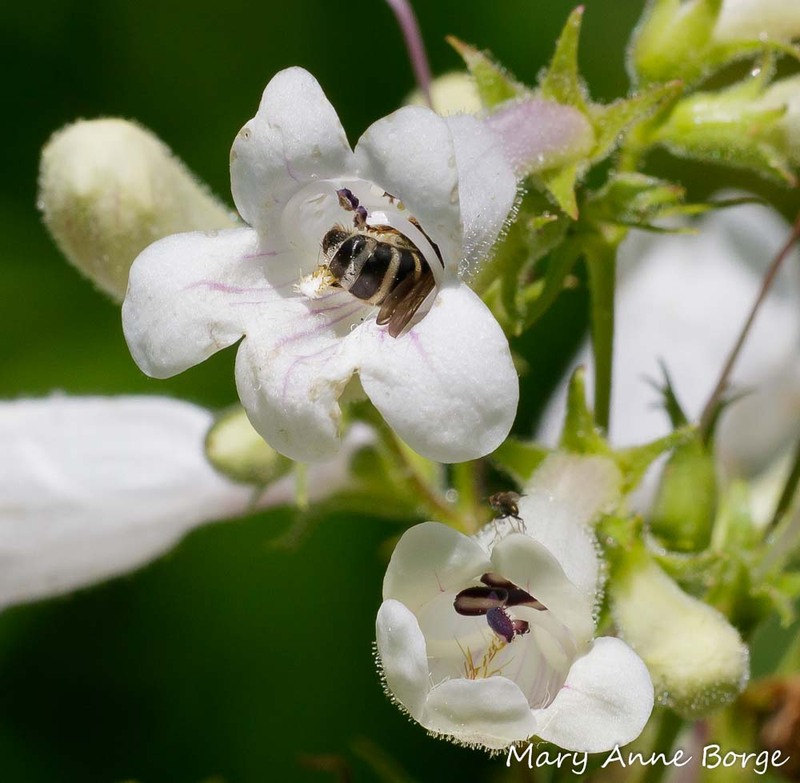 White or Foxglove Beardtongue (Penstemon digitalis) blooms in late spring to early summer, offering nectar and pollen to flower visitors. It’s easy to recognize in fields and along roadsides by its upright habit and its inflorescence of many whitish flowers, all positioned perpendicularly to the stem. The name Penstemon reflects the fact that these flowers each have five male flower parts, called stamens. ‘Foxglove’ and ‘digitalis’ both refer to the shape of the flowers, which resemble those of Foxglove (Digitalis purpurea). 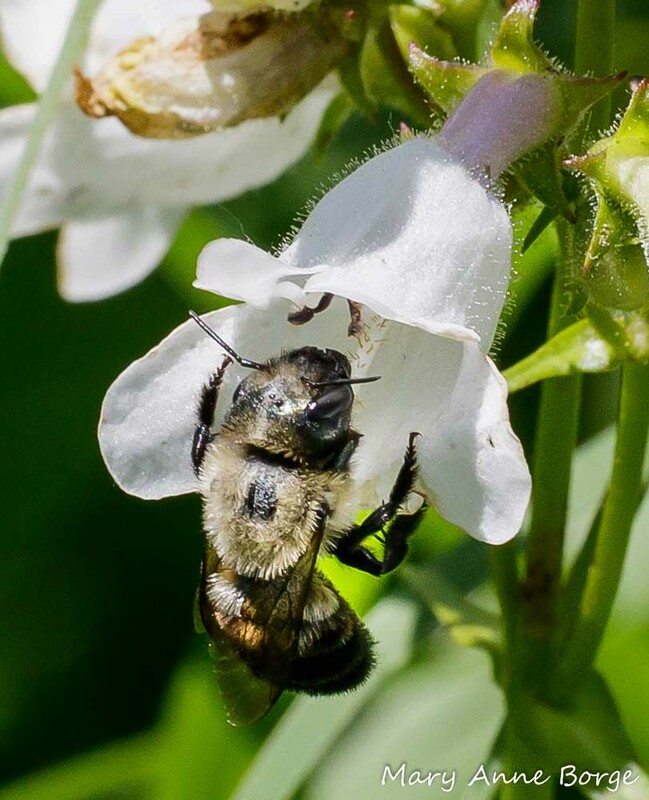 The white flowers beckon to a variety of bees who are enticed by the possibility of a meal of nectar and pollen, with the purple lines (nectar guides) on the throat of the flower showing them the way. In addition to feeding themselves, female bees also harvest pollen and nectar to provision their nests for their larvae. But if bees are eating and harvesting the pollen, how will the flowers be pollinated? Will there be any pollen left to fulfill the plant’s goal of reproduction? 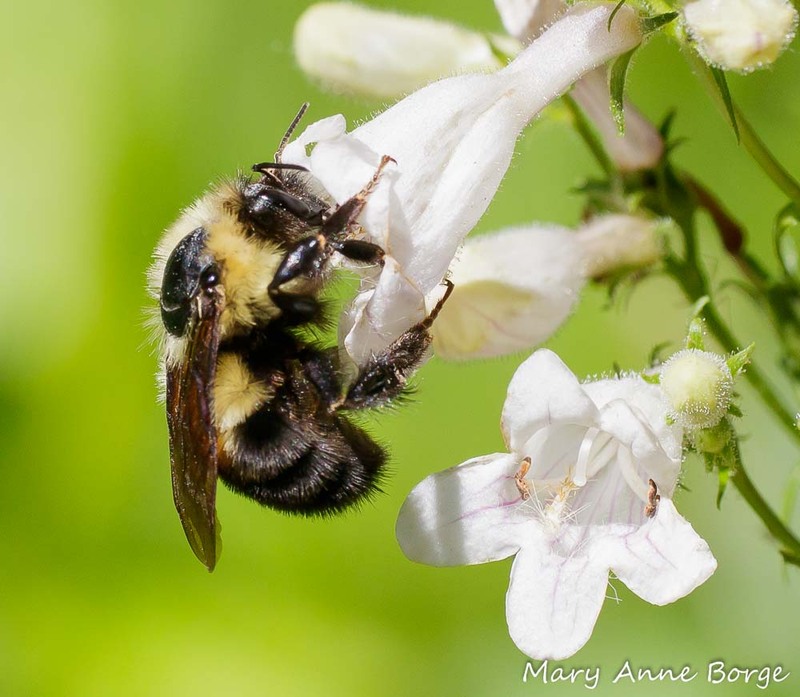 Female Bumble Bee on White Beardtongue (Penstemon digitalis). Note the harvested food on her hind leg. 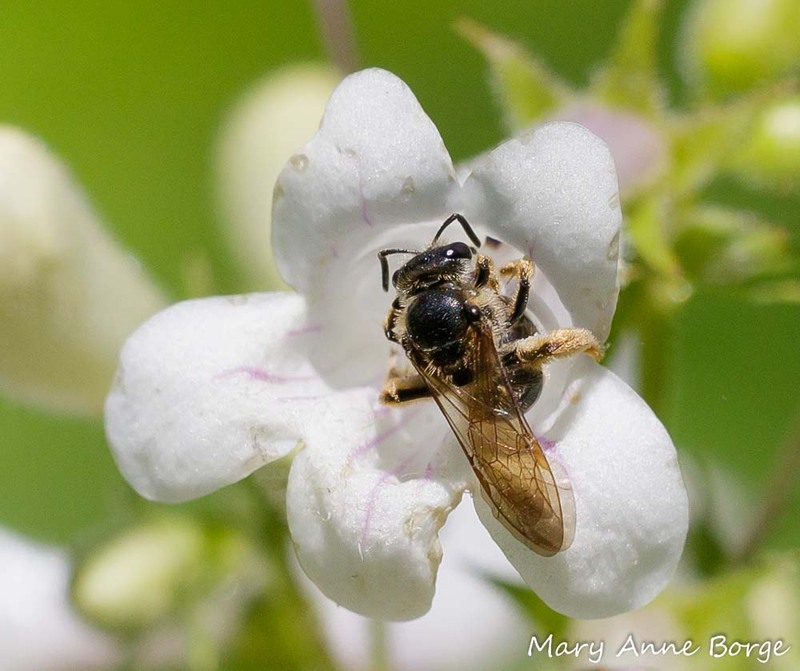 Although much of its pollen is used to entice and reward insect visitors, White Beardtongue’s strategy is to deposit pollen on its flower visitors’ bodies in a place that can’t be easily reached for grooming. The flowers have both male and female parts, but they are sequentially unisexual. The male flower parts, or stamens, mature first, with the anthers at their tips opening up to release pollen. 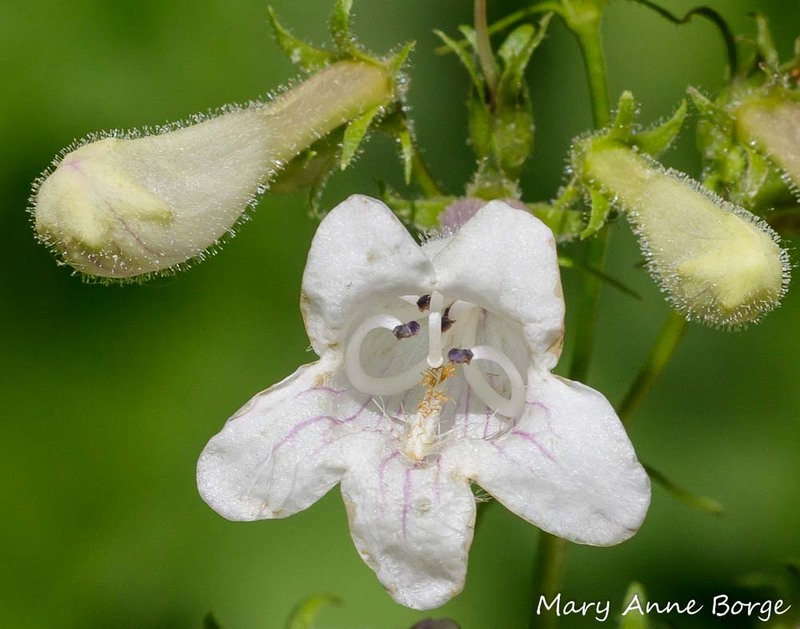 Although White Beardtongue has five stamens, only four are capable of producing fertile pollen. These four stamens are all positioned just below the ‘roof’ of the flower tube, or corolla. The dark brown anthers, which contain the pollen, are at the tips of the stamens, clustering above the center of the entrance to the flower. White Beardtongue (Penstemon digitalis) in the male phase. The dark brown anthers are clustered just below the center of the ‘roof’ of the flower. When the flowers are in this phase, a visitor like the Bumble Bee in the photo below may enter the flower, and be brushed with pollen on the top of its head, thorax or even its tongue (proboscis). 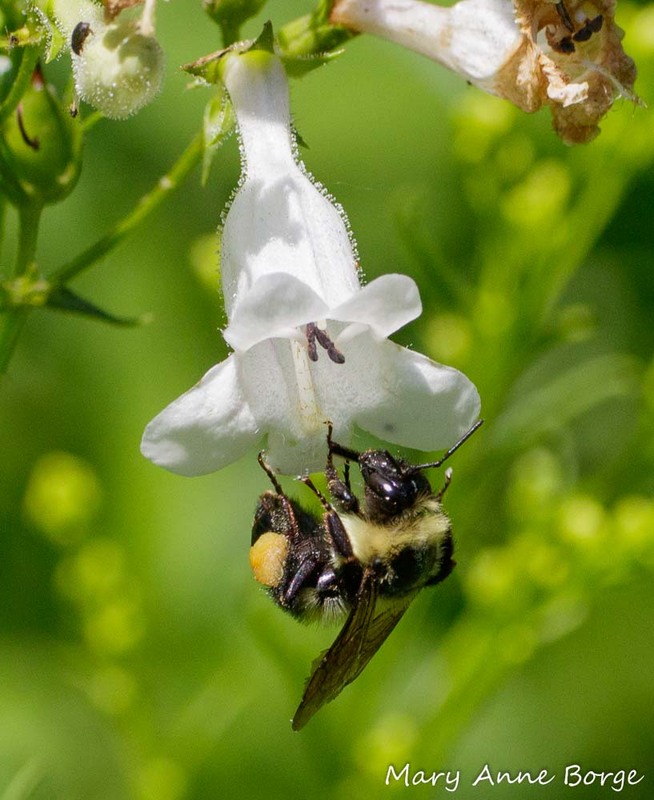 Bumble Bee on White Beardtongue (Penstemon digitalis). After a day or so, the anthers begin to wither and the female flower part begins to mature, the sticky stigma at its tip becoming receptive to pollen. The style extends and curves downward, taking the same position that the anthers once held. White Beardtongue (Penstemon digitalis) in the female phase. The stigma has replaced the anthers just below the center of the ‘roof’ of the flower. If a bee carries the pollen to a flower in the female phase, it will generally enter the flower in the same way, depositing the pollen on the receptive stigma. Success! White Beardtongue’s pollination strategy has worked. 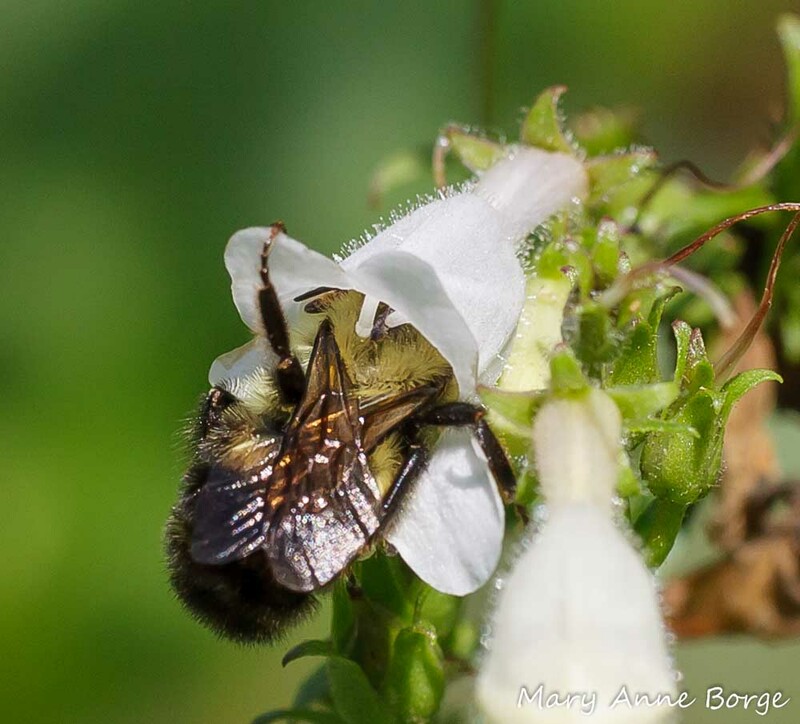 Bumble Bee depositing pollen on stigma of a White Beardtongue (Penstemon digitalis) in the female phase. Some pollen may fall on the ‘floor’ of the flower, where the fifth stamen is positioned. This stamen is sterile; it does not produce its own pollen. 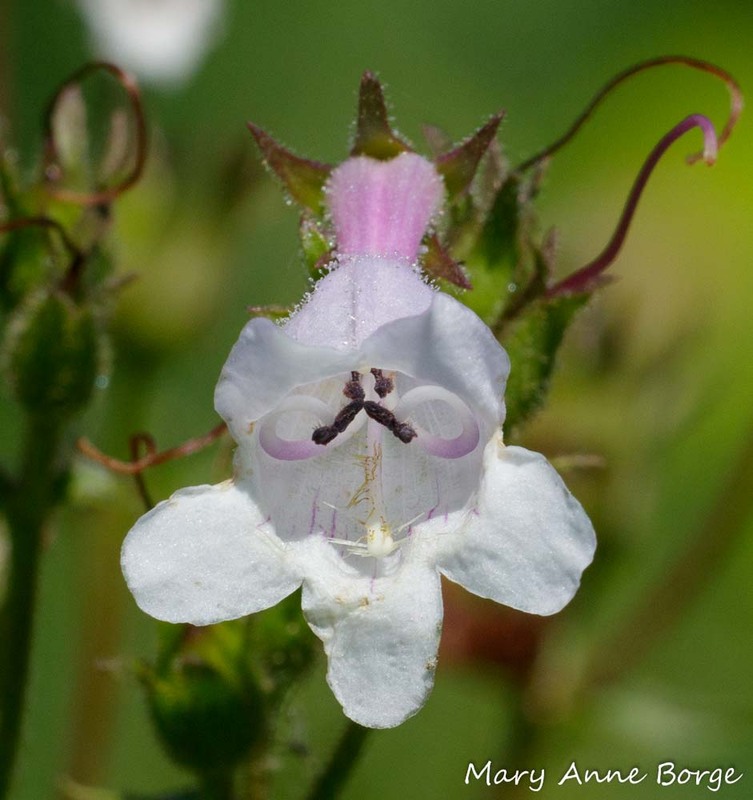 It is somewhat hairy, giving the plant its common name ‘beardtongue’. This hairy stamen may catch some of the fallen pollen and deposit it on an insect visitor as it brushes past, a secondary means of pollen dispersal. Some smaller bees may cling upside down while foraging for pollen. Butterflies and even hummingbirds may stop by for nectar. 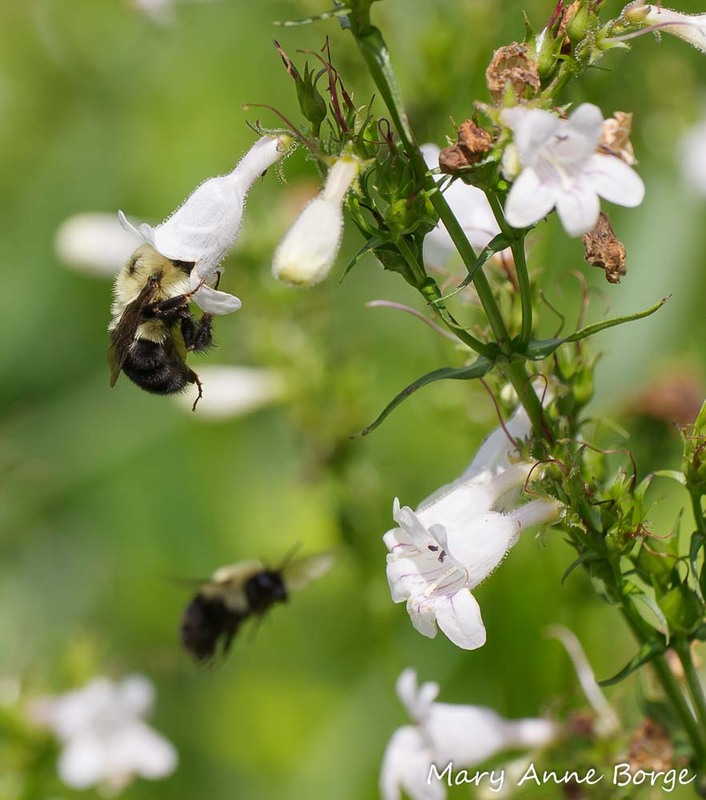 They may not be as effective in pollinating White Beardtongue as the bees are if their anatomy and behavior is not as good a match for the anatomy of the flower. On the plus side, neither butterflies nor hummingbirds harvest pollen, so any that does adhere to them has the possibility of being deposited on another flower. 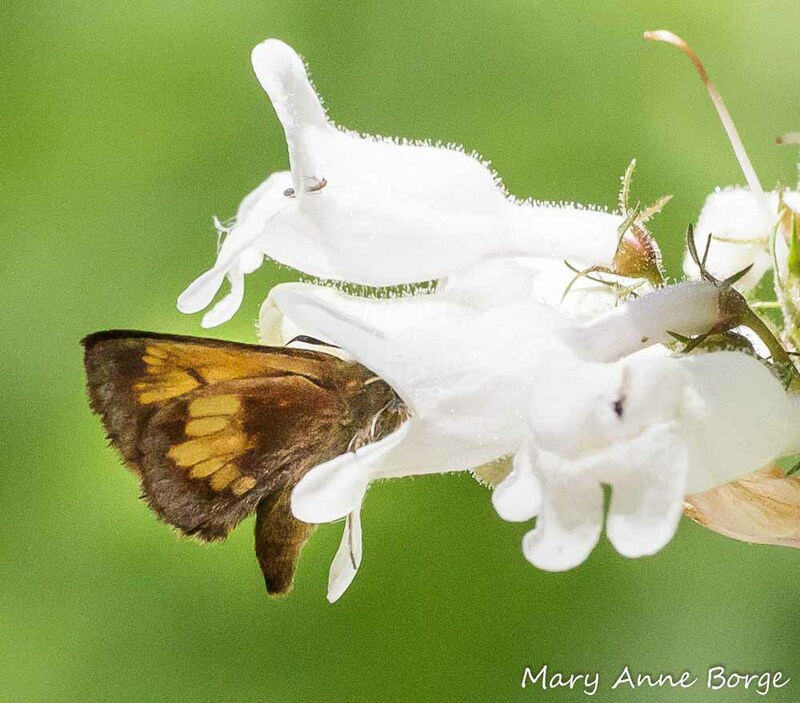 Hobomok Skipper butterfly visiting White Beardtongue (Penstemon digitalis) for nectar. It may be just the right size to pick up or deliver pollen on its head. 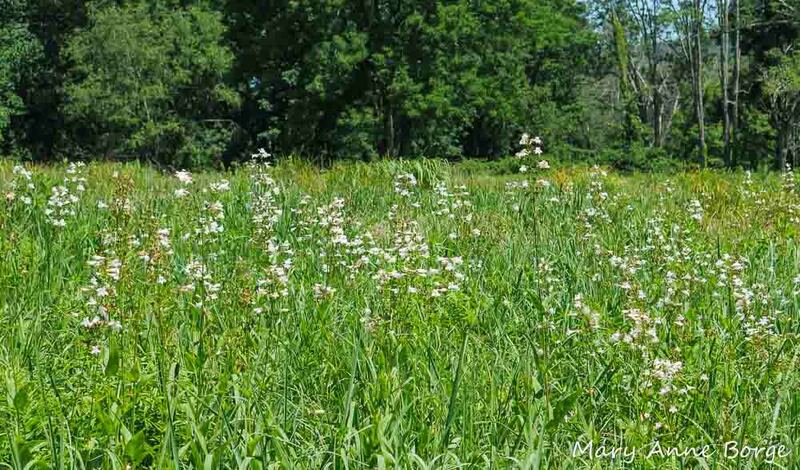 White Beardtongue blooms for a period of about a month in June to early July. It is native in the eastern two-thirds of the United States, and is found in several Canadian provinces. It can tolerate sun to part shade in dry to somewhat moist, well-drained soil, and grows to a height of 2-5 feet (6 – 15 decimeters). It’s a good addition to a natural area or a pollinator garden. Holm, Heather. Pollinators of Native Plants. 2014. 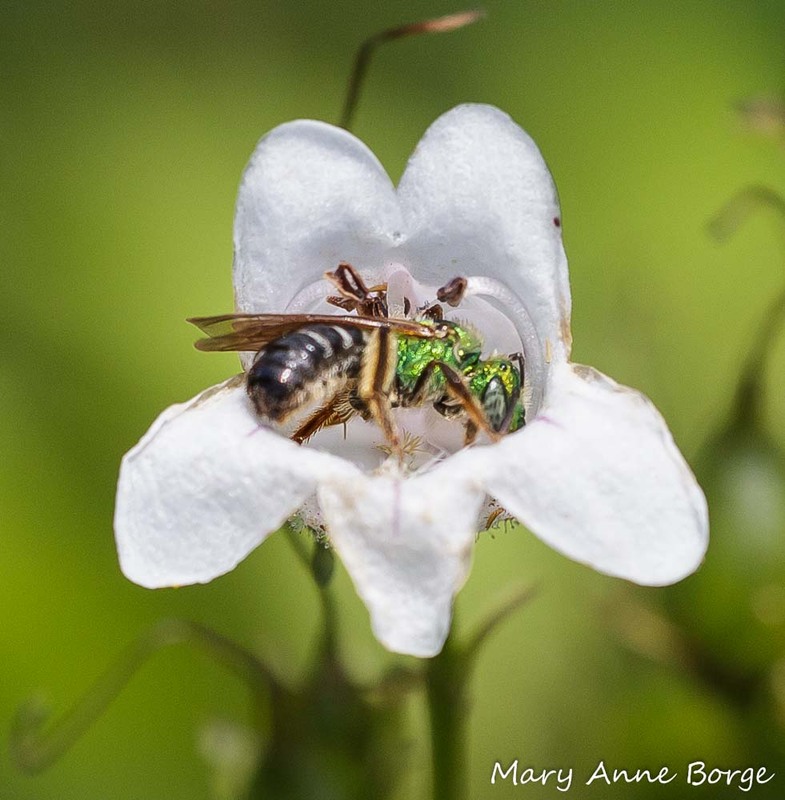 This entry was posted in Birds, Butterflies, Gardening for Wildlife, Native Plants, Nature, Other Insects and Spiders and tagged Foxglove Beardtongue, Penstemon digitalis, Pollination strategy, Pollinators, White Beardtongue by Mary Anne Borge. Bookmark the permalink. Such a wonderful post with outstanding photography! Thanks, Mary Anne!!! I just LOVE this post and all of yours!! Mary Anne, your pictures are just OUTSTANDING!!! I have Spreading Dogbane all over my yard (never planted it) but it’s truly a great nectar source! I never noticed the any caterpillars on it but everyone nectars there! I’m headed out now with a hand lens to study the inside of these flowers! Sooo interesting! Birds need to eat plenty of insects! Thanks, Patricia. Such beautifully detailed photos to illustrate your points, Mary Anne! So very much appreciated. Thank you!